Bioactive Compounds with Powerful Medicinal Properties. Turmeric is the spice that gives curry its yellow color. It has been used in India for thousands of years as a spice and medicinal herb. Recently, science has started to back up what the Indians have known for a long time… it really does contain compounds with medicinal properties. These compounds are called curcuminoids, the most important of which is curcumin. Curcumin is the main active ingredient in turmeric. It has powerful anti-inflammatory effects and is a very strong antioxidant. However, the curcumin content of turmeric is not that high… it’s around 3%, by weight. Most of the studies on this herb are using turmeric extracts that contain mostly curcumin itself, with dosages usually exceeding 1 gram per day. It would be very difficult to reach these levels just using the turmeric spice in your foods. Therefore, if you want to experience the full effects, then you need to take an extract that contains significant amounts of curcumin. Unfortunately, curcumin is poorly absorbed into the bloodstream. It helps to consume black pepper with it, which contains piperine… a natural substance that enhances the absorption of curcumin by 2000%. I personally prefer to swallow a few whole peppercorns along with my curcumin supplement, in order to enhance absorption. Inflammation is incredibly important. It helps the body fight foreign invaders and also has a role in repairing damage. Without inflammation, pathogens like bacteria could easily take over our bodies and kill us. Although acute (short-term) inflammation is beneficial, it can become a major problem when it is chronic (long-term) and inappropriately deployed against the body’s own tissues. It is now believed that chronic, low-level inflammation plays a major role in almost every chronic, Western disease. This includes heart disease, cancer, metabolic syndrome, Alzheimer’s and various degenerative conditions. Therefore, anything that can help fight chronic inflammation is of potential importance in preventing and even treating these diseases. 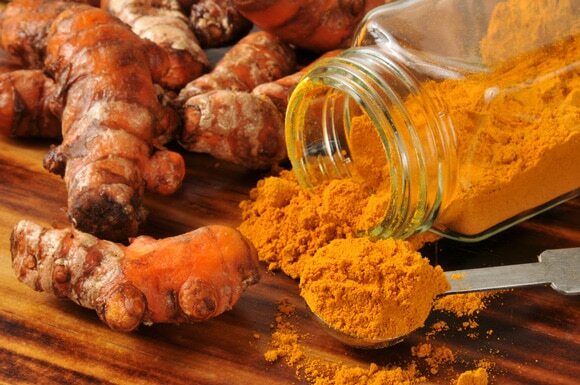 It turns out that curcumin is strongly anti-inflammatory, it is so powerful that it matches the effectiveness of some anti-inflammatory drugs. Curcumin actually targets multiple steps in the inflammatory pathway, at the molecular level. Curcumin blocks NF-kB, a molecule that travels into the nuclei of cells and turns on genes related to inflammation. NF-kB is believed to play a major role in many chronic diseases. To read the whole article by Kris Gunnars, click here.